CDRLabs has taken an in depth look at Kingston's new HyperX Savage SSD. 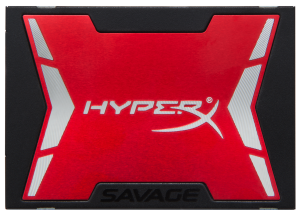 Designed to satisfy the most demanding consumers, enthusiasts and gamers, the Savage is the fastest SATA-based SSD in the HyperX family. The drive is powered by a quad-core, eight-channel Phison PS3110-S10 controller and is equipped with up to 960GB of Toshiba's Advanced 19nm (A19) MLC NAND flash. With sequential speeds of up to 560 MB/s read and 530 MB/s write, and IOPS of up to 100,000 read and 89,000 write, the HyperX Savage offers higher performance, ultra-responsive multitasking and an overall faster system.